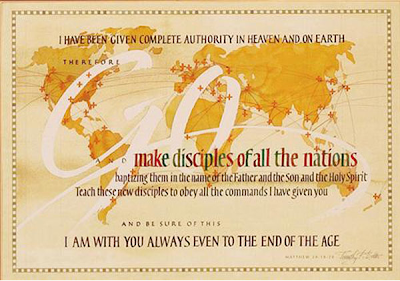 The great commission is not merely one of the things that the church is to be about. This is the pinnacle of what the church is to be about. This is our mission. No matter what else we do - Sunday worship, choirs, bands, youth activities, children's ministry, etc. - we are called to accomplish our main mission. There's nothing wrong with any of the things listed above. They are all good things. But they are not ultimate things. They are all means to accomplish the main mission. What is the main mission? The great commission. Here's the thing. God didn't create the church and then sit around wondering about what the church should be about. From the beginning of creation to the end of time, God's desire has been to reconcile the world to himself. And the church was brought into existence because in God's sovereign omnipotence God determined the church to be the best tool and instrument to accomplish his mission. Jesus completed the mission. The church is now the one who is called to proclaim what God has done for the world. The great commission is not something we choose to do in our spare time as the church. This is our mission. This is why we exist. In the next three days, we will be looking at each of these one at a time. Why the Church Exists Part 1: Go!! !